I’m 38,000 feet over Albuquerque, New Mexico, when the newborn in 8B begins crying. I can hear it all — including the woman behind me whining and sighing to her husband — despite my noise canceling headphones. I left Maggie and Abbi at 7:06 am. 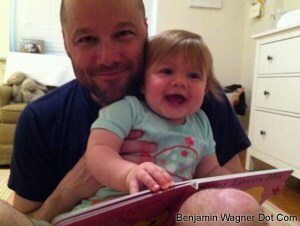 I won’t return until roughly the same time next Tuesday, June 7th — Maggie’s first birthday. There was just enough time this morning to wake Maggie, change her diaper, and sprint for the door for my nine o’clock flight. She woke up singing quietly to herself, lay patiently for her change, and held her own bottle. Abbi walked her to the door, I stole a kiss (she delivers on our kiss requests about 2% of the time, making each one sweeter still), and grabbed my bags. Abbi, Maggie and I spent nearly every second together. 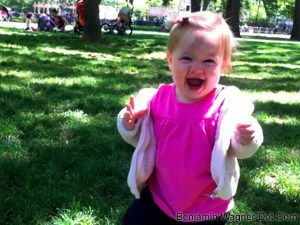 We went to Central Park a whopping three times, and St. Catherine’s twice. Maggie played in her first sandbox (tentatively), ran her first 5k (well, in our new jogging stroller), chased bubbles barefoot, and swung on innumerable swingsets. Even the mundane felt magical. At Home Depot, she walked wide-eyed down the football field-aisles, stood flummuxed, windblown by a massive fan, and charmed nearly every employee in the place with her determined waddle, gleaming blue eyes and infectious smile. Friends of ours, a younger couple, visited us for lunch Saturday. He’s a young rock star. She’s a tv producer. They’ve been married a few years and are probably beginning the careful, deliberate conversations that end (ideally) with a new life. Abbi laughed as I told them both how massively recalibrating parenthood has been. Everything that I thought mattered — rock shows, record deals, late nights — had been immediately replaced by something — someone — that really mattered. Every step is a miracle. Every gesture is a gift. And every smile is a revelation. I am finally free (largely, not entirely) of myself; it really is all about her, and all about us. Which only makes leaving that much more painful. I spent the entire ride to JFK (well set-designed by Whomever Is In Charge Of The Universe with fog, gray sky, and black sheets of rain) listening to REM’s “Every Day Is Yours To Win,” the band’s recent update to its maudlin chestnut, “Everybody Hurts.” The gently arpeggiated guitar lulled me into a deeper melancholy still. Here I am, now, landed and checked-in some 2,800 miles west of my precious daughter. The sun is coming up on Tuesday, and the only consolation is an iPhone full of photos, the promise of iChat, the fact that time passes, and the knowledge that her song is in my heart on infinite repeat.